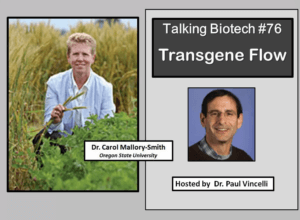 Talking Biotech: What environmental hazards remain from accidental release of GMO grass seeds? This week’s podcast is a cautionary tale of what can happen when genetically-engineered crops are introduced to the environment. Circumstances may lead to release of the transgene into sexually compatible wild plants, leading to its persistence in non-crop species. Dr. Carol Mallory-Smith from Oregon State University has analyzed gene flow in grasses, and was the perfect match for understanding the issue of gene flow from genetically engineered, Roundup Ready, creeping bentgrass in Oregon. Her work has detailed how a genetic engineering plan to aid the consumer resulted in unwanted environmental impacts. Dr. Mallory-Smith’s work demonstrates that transgene escape and gene flow need to be carefully considered when establishing trials and during deregulation of GE crops. Hosted by Dr. Paul Vincelli.